GSMS61 센서는 가스누설경보기용으로, 기존 산화물 반도체 센서의 단점인 선택성을 대폭 향상 시킨 제품으로써, 특히 주방 요리 시 발생하는 각종 가스에 탁월한 선택성을 가지고 있으며, 안정된 감지구조를 확보하여, 반영구적 사용이 가능하다. 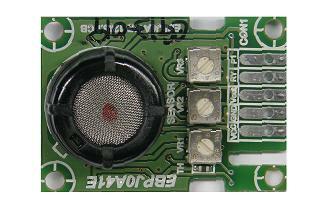 GSMS61 sensor is used as a gas leakage detection alarm. The product has dramatically enhanced selectivity, which was formerly a shortcoming with existing oxide semiconductor sensors. It shows superior selectivity in detecting various gases that are generated while cooking in the kitchen and its reliable detection structure enables semi-permanent usage.